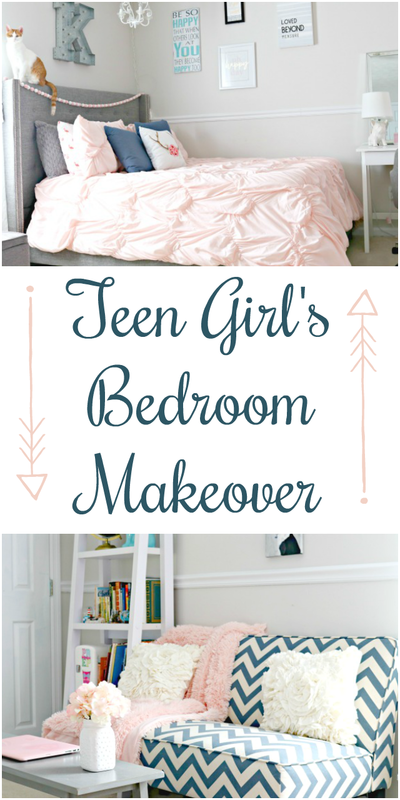 This teen girl’s bedroom makeover is full of feminine touches and tons of personality! I partnered with Dorel and Walmart to bring you this post. All opinions, photos and ideas are 100% mine. This year, Kate turned 14 and started high school. She had put her American Girl dolls and stuffed animals away a couple of years ago, but her room still felt a bit like a little girl’s room. We talked a lot about what she wanted her room to feel like, and she said she’d like a hangout spot, somewhere to do here homework and makeup, and she wanted her bed to be bigger, as well as super cozy and feminine. The first thing we had to tackle was getting her a bigger bed. 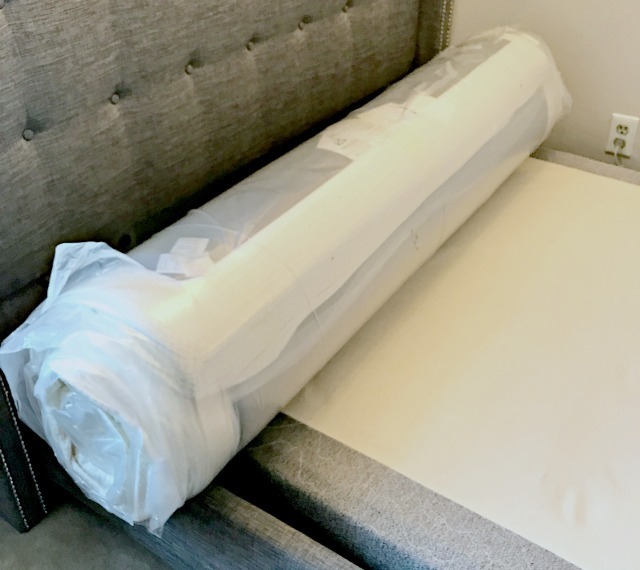 We found a beautiful full-sized tufted headboard online that she loved, so the next thing we needed was a full-sized mattress. 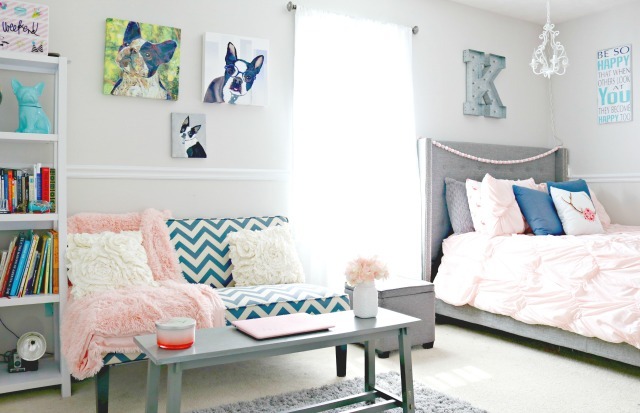 Her room before was super girly and fun! She loved aqua (and still does), so we painted so many things her favorite shade, but after a while, she grew tired of it. This time, we went with a soft grey to keep the walls neutral in case she wants to change things up some time. Before we get to the details of her new room, let me tell you a little bit about the new mattress she got! I have to admit, I was a bit skeptical when I was unpacking it. I mean, it was sooo flat! But that didn’t last once I opened the packaging and let it expand…it was like magic! In no time, the mattress expanded to its full height and Kate said it was the most comfortable bed she has ever slept in. I took it for a test drive and had a nice cat nap on it…she wasn’t kidding! It really is super comfortable, so we could definitely check cozy off of her list of needs! 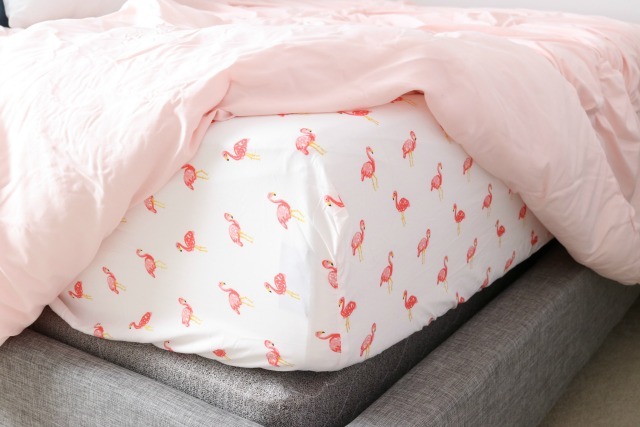 And…it fits her new flamingo sheets perfectly! As you know, I am super choosy about the products I allow in our home. 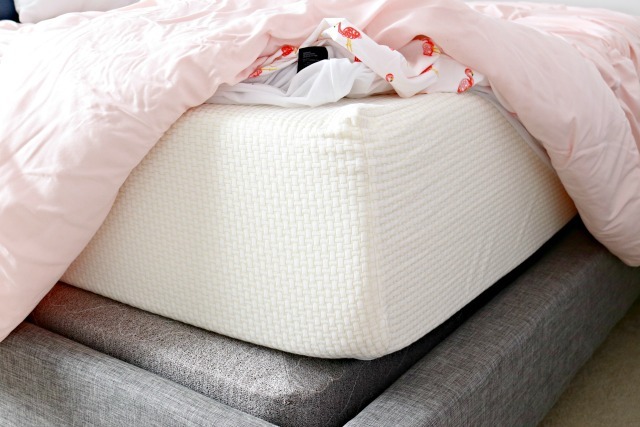 The Signature Sleep Gold Memory Foam Mattress was perfect for us because it’s made without ozone depleters, PBDE’s, TDCPP flame retardants, mercury, lead, formaldehyde, or phthalates. All things I am happy to do without! Blush pink is her favorite color right now, so finding her bedding was super easy. Once we settled on the blush colored comforter, we knew we needed to add a little more color. She really loves navy blue as well, so we added some navy throw pillows for a nice pop of color. My friend Lucy from Craftberry Bush designed the pillow that is on her bed, and it’s just perfect for her new space! Once we had tackled her bed and made sure it was just right, we worked on her sitting area, or the hangout spot. I already had the small navy couch at my studio, so I let her take it home since it was the perfect size and color. She’s slightly obsessed with Boston Terriers since we have two, so we found some cute Boston Terrier wall art and a cookie jar (for snacks). 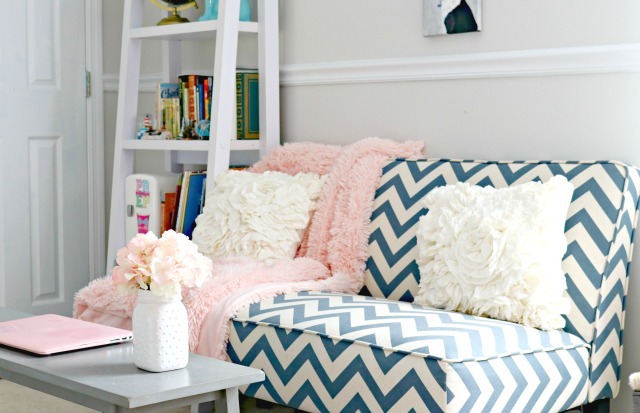 We brought the blush pink to this part of the room using a super plush throw that she can curl up in while watching movies or reading, and we added a bench in lieu of a coffee table so she can also have her laptop close by. 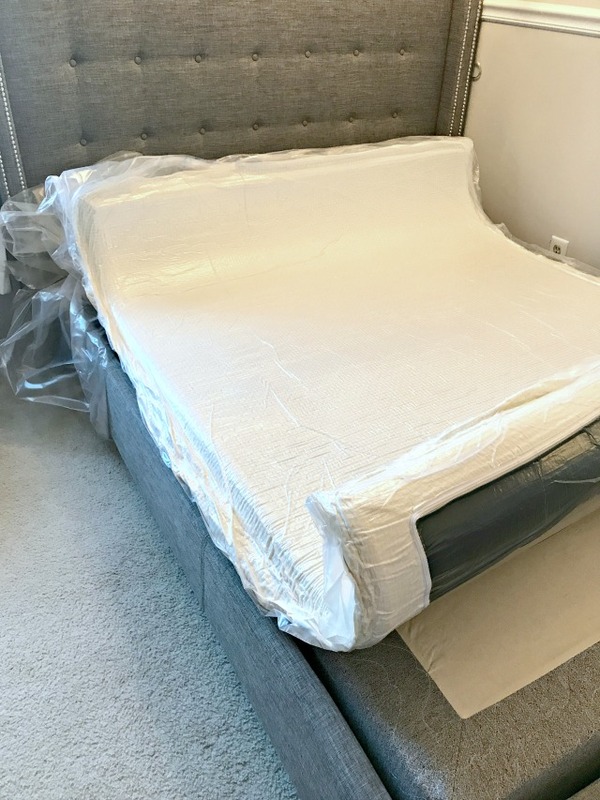 The Signature Sleep Gold Memory Foam Mattress is an amazing mattress and really helped bring my girl’s room together, and is a great, affordable option if you are looking for a mattress. It comes in all sizes and you can have it shipped to you or pick up at Walmart as well! What a beautiful room! It’s very fun, girly, and comfy. May I ask about clothing storage? Is it all in the closet? LOVE the comforter!!! Where did you buy it? 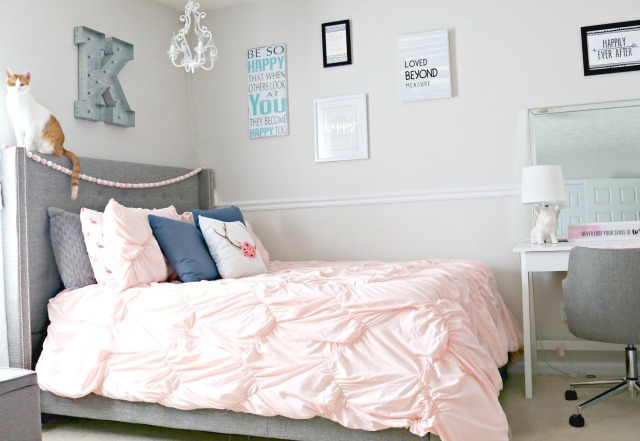 Her room is just perfect and so feminine for a high school girl. Absolutely gorgeous !!! Hi, Nancy! Thank you! The comforter is from Target, and she loves it! Which comforter is it from Target? Do you happen to remember! Love this room! 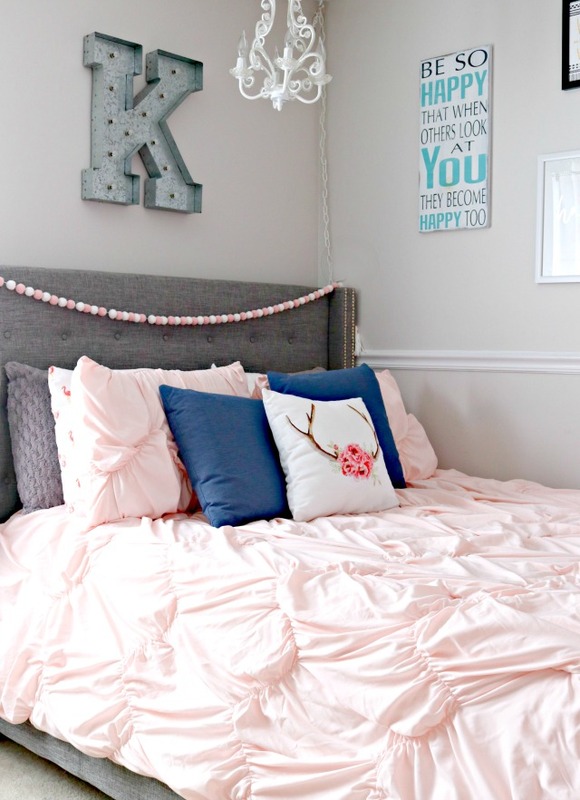 The blush colored comforter is from Target, and we love it! You have been busy! Beautiful room! The room is beautiful! A very lucky girl! Where is the gray upholstered bed from? It is adorable! I am looking for something similar for our guest room. Love it! What color did you use on the walls?